Home / Archive by category "Individualized Education Plans"
Congratulations! You made it through this mini-course on the Service Delivery Grid. I hope that you will be able to see the story that is told in this spreadsheet. In the service delivery grid, you see how many services are working to help your child achieve the annual goals. Some services, like academic support, address multiple goals. You also see when your child is in small classes outside the general curriculum and when your child is with general education students but with some special education support. You see when things are happening and how often. It is important to check this grid with your child’s schedule. Sometimes there is an error. With a little comparison, you can make sure everything matches. Now you can talk to your Team like a pro! The dates of the Service Delivery Grid on your IEP tell the story of the next year for your child. Look at the dates and classes below. Notice that there is a start date column and an end date column. 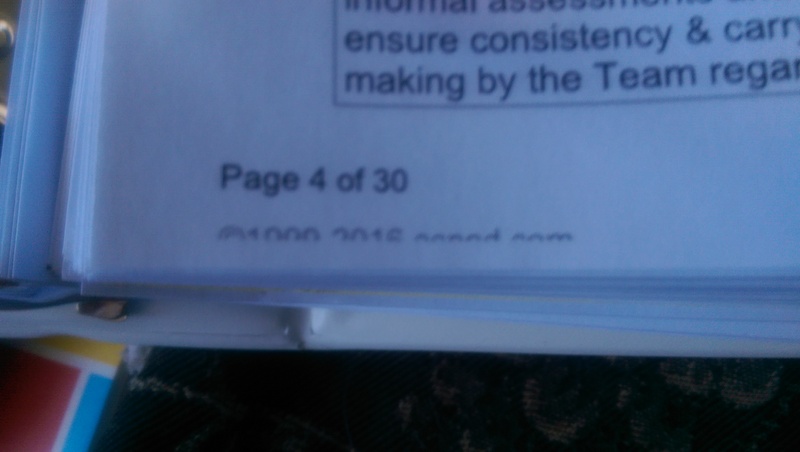 Do you see that the math class ends on 6/20/14? Math with the special educator is ending in June, presumably at the end of the school year. So what happens to math in the fall? 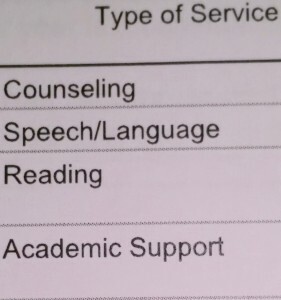 Why is math not listed until 1/31/15, like the occupational therapy? Look up at the B grid. Math is starting with a general educator and the special educator on 8/25/15. Since it is on the B grid, we know that it is in the general education classroom. So this child is in a small class, outside the general education classroom, until the end of the school year in 2014. Starting in the fall, the student will join a general education math class that has a special educator in it. Meanwhile, we can look at the “Education” – the last item on the C grid. The dates are 7/6/14 to 8/15/14. This shows us that “Education” means a summer program. We know from the frequency column that summer school meets four times per cycle (or week, in this case) for 180 minutes. Occupational therapy will continue into the next school year for this student. We know that because the start date is 2/1/14 and the end date is the last day of the IEP, 1/31/15. So even though the Start and End dates seem easy, they actually contain some nuanced information. With the dates, you see when any changes to your child schedule will occur. It is important to look at those dates to make sure they reflect your understanding of the services and when they will happen. Let’s say your child has an IEP goal of occupational therapy. We have seen that occupational therapy is on the IEP service delivery grid and that the grid notes that a therapist is providing the service. How often does that service happen? For how long? Welcome to the fourth column on the service delivery grid, the frequency column. Once again, this could be under the A, B, or C grid. We are going to focus on the B and C grids, because those are for direct service to the child. This shows how many times per cycle this service happens, and for how long. You see two numbers with “x” between them. The second number is easy to understand. It is the number of minutes of each meeting. In this case, a class period is 45 minutes. So the math class is 45 minutes long. This is a general education class – we know that because it is on the B grid. Going down to the C grid, we see that the length of time that a student meets with the occupational therapist is 30 minutes. What is that 180 on the last number? If I zoom out to show the entire grid (see below), we see that it means summer school. But we only know that because of the dates, which is our next entry. In this case, the child is in summer school for 180 minutes per session, or three hours per day in the summer. Now for that first number in the frequency. It means how many time the service is delivered per cycle. Not per week. Per cycle. Your child’s school may have a six-day cycle. I have taught six-day cycles in middle school and high school. In that case, the child would have math, say, 6 x 45. But in the images here, the student has a five-day cycle. We see 5 x 45 for math. As for the summer school frequency, we already noted that the child goes to school for three hours per meeting, or 180 minutes. You can see that the first number is 4. The school is on a five-day cycle, but summer school only meets four days per week. So the child goes to summer school four days per week for three hours per day. By looking at the Frequency and Duration column, you can understand your child’s day. Any classes that are not on this grid would mean that the child has a general education class with a general educator. The next column in the Service Delivery Grid of the IEP is the Type of Personnel. So far, we have the goal number, which refers to the Measurable Annual Goals and the Type of Service. We can tell something about the type of classroom or setting by looking at the Type of Personnel. This tells us who will be delivering the services to your child. The first service provider on this list is a pair made of a general educator and special educator. The pair is under the B grid, which, as you remember from my previous post, means the service happens in a general education classroom. This pair is teaching in an “inclusion” classroom. 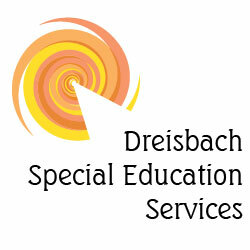 The class has students from both general education and special education programs. The special educator may co-teach the class, the special educator may pull certain students to smaller groups within the class, or s/he may support students as needed during the class, going from student to student. In any case, the general educator and special educator are both working to meet that goal of the student. Then we move to the C grid. You remember that the C grid means services that happen outside the general education setting. The first item on this list shows a class with a special educator only. This might be a study class or a small academic class. 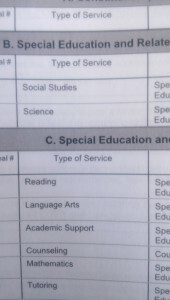 Notice that the last item on this list is a pair of a special educator and educational support personnel. This is a class that is led by a special educator with another assistant in the room. It is possible that the class with only the special educator DOES have an assistant in the room, like the last class on this list. 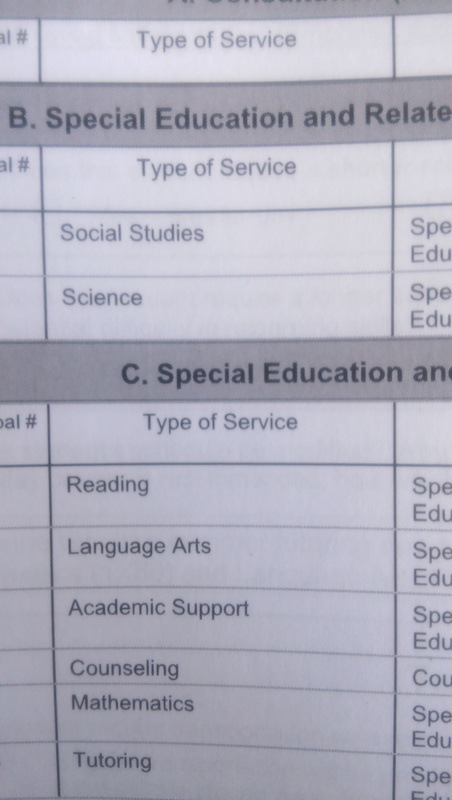 The difference is that the last class is required to have an assistant, according to this IEP. You also see that the child has a meeting with an occupational therapist. All kinds of providers can be listed here: speech, counseling, literacy, behavior, etc. The second column on the Service Delivery Grid of the IEP is Type of Service. This is what it sounds like. It lists the subject area that will be added or modified for your child’s particular needs. 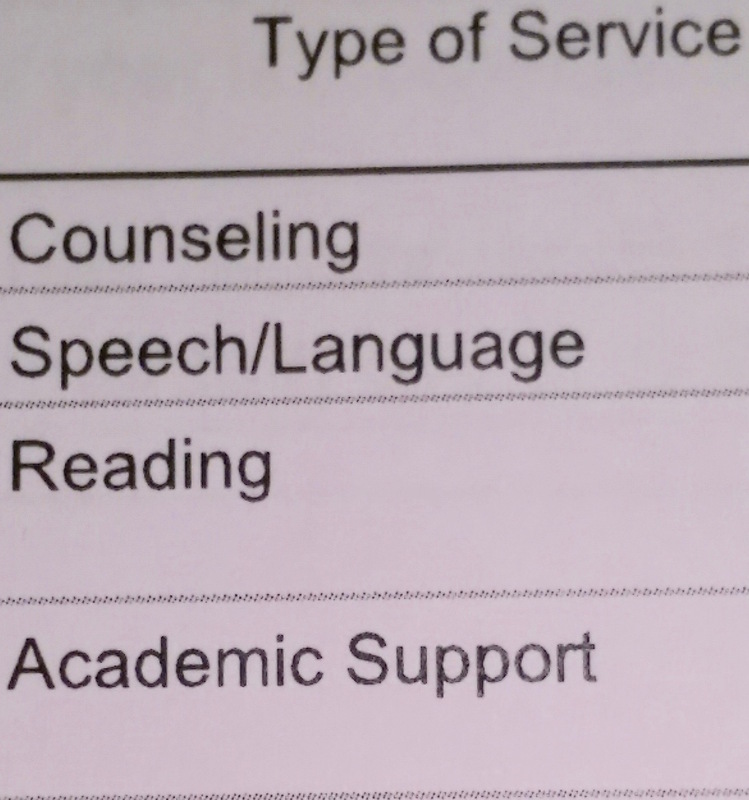 The child in the photo has counseling, speech/language, reading and academic support. 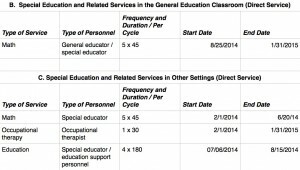 C Grid – Special Education and Related Services in Other Settings? Each grid has a Type of Service. So if your child has English Language Arts in a general education classroom that has a special educator as a co-teacher, English Language Arts will be on the B Grid. On the other hand, if your child has English Language Arts in a smaller classroom with only students who have a small ELA class on their Individual Education Plans, then English Language Arts will be on the C Grid. You’ll notice that Type of Service is not just for academics. It is also for counseling, speech, occupational therapy, and other areas of need that are identified in the IEP. Again, remember that for an item to be on the Service Delivery Grid, it must have a goal. If it has a goal, it needs to have data backing up that goal. Not only do poor goals create problems for students, they can create issues for the school districts. There are two major reasons that goals stay the same from year to year: lack of student progress, and poor wording of the goals. Let’s look at the first reason. Goals might stay the same because the student is not achieving them. There is a system to address this issue, and it is active throughout the year. When the annual IEP meeting is held, the Team should determine that the student has achieved the goals of the previous IEP. New goals are then written. 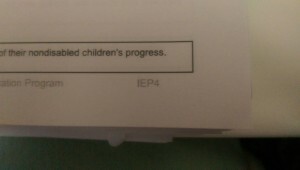 An IEP goal that remains the same as the previous year technically means that the child has not achieved that goal. But you shouldn’t get to the annual meeting and suddenly realize that the goal hasn’t been achieved. If the child has not been progressing enough to reach the goal, this issue should have been addressed in the child’s periodic progress reports. Then, partway through the year, if the student is still not on track to meet the goal, the teacher should call a progress meeting. At a progress meeting, parent(s), teachers and staff discuss why the student is not achieving the goal. Are the accommodations and modifications being followed by teachers and other educators? Is the student completing homework and schoolwork? Is the student seeking extra help, as is often expected for all students? Is there another health or social issue which may be affecting the student’s performance? If everything specified in the IEP is happening and if the student is seeking extra help but still not achieving a goal, then the goal is rewritten. Every goal in the IEP needs to be attainable for the child. If the goal proves to be unattainable, it needs to change. Sometimes, a child achieves part of a goal. In that case, the unattained portion might remain and new higher levels of achievement are added. While not ideal, at least this keeps the momentum moving forward. 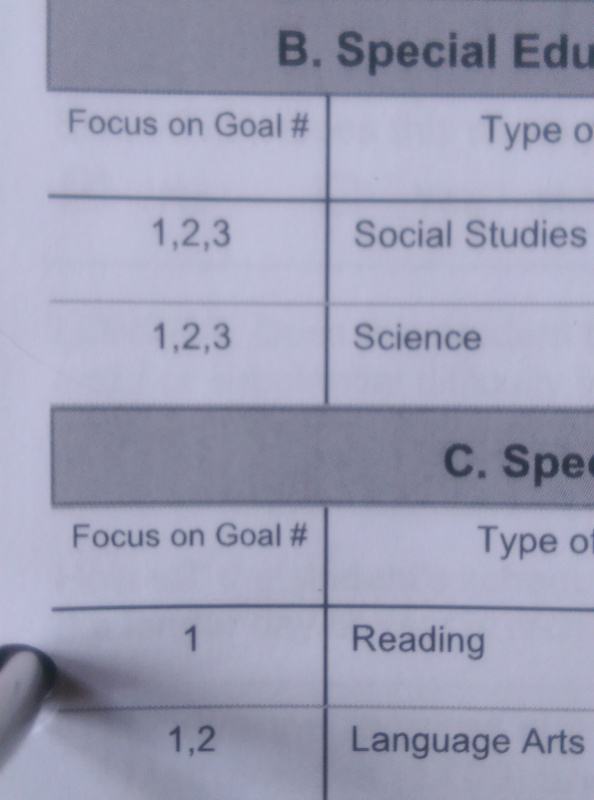 The tricky part about writing goals is to make them broad enough to describe learning in the coming year but specific enough to mean something about this child. A goal that is so specific as, “Andre will know 90% of multiplication tables up to 12” may address his difficulties with multiplication but may not address his challenges with the bulk of the math curriculum. And yet, if team merely copies the topics from the math curriculum (which I have seen done), then the IEP becomes a mirror of the general education program – not individualized at all. The other common reason that goals stay the same is that they are so general that they could apply to any year of a student’s education, regardless of the student’s actual achievement. “Andre will correctly answer 80% of problems in grade-level math assessments.” Hey, it worked last year, it still works for this year. And it even has a percentage in it and it says “grade-level”! Wrong. What is being assessed? At what grade level does he perform now? Any district can improve its goal writing. The improvement can happen at multiple points in the IEP writing process: by the Team at the annual meeting; when an educator writes the final version of the IEP; when the administrator approves the IEP prior to sending to parents; when the parent receives the IEP for approval. The best time is at the annual meeting. Whether you are a teacher, parent or administrator, you can have input about the goals. What is the child ready to learn in the next year that will make a real difference in mastering the subject? The current popular lingo, “SMART goals,” is helpful. Specific; measurable; attainable, realistic, timely. I like goals that have 2-4 elements. Usually, 2-4 elements will cover a subject broadly enough that if the child is achieving them, s/he is in pretty good shape with the curriculum. The child may not be at grade level, but critical pieces of the curriculum are being learned. Well-written goals are a key tool to tracking students’ progress. The criticism that York, Maine, has received can apply to many many districts. Whether we are parents or school educators, we can all take a little time to improve those IEP goals and to improve our service to the kids who need us. And maybe as we gain on those goals, we’ll get better at writing our own resolutions for next year. What are the parts of an IEP? Every IEP has the same seven components. This section is a small paragraph at the beginning of the IEP. It records concerns that the parent and/or student have concerning the student’s school work or activities. e. the hopes that the team has for the student. This is also called PLEP A and PLEP B, or Present Levels of Performance A and B. A is for academic work; B is for nonacademic activities. Each section begins with a description how the student’s disability affects the student’s ability to access the general curriculum. Then come lists of accommodations and modifications to be made so that the student can access the general curriculum. If the student cannot access the general curriculum, specific modifications to the curriculum will be stipulated here. The IEP might have one goal or more than five goals, depending on the needs of the student. Each goal covers one area, like mathematics, science, speech, counseling, occupational therapy. For each goal, there will be a paragraph describing what the student can do. Then follows a measurable goal that the student can be expected to attain within the next year (or remaining period of the IEP). Benchmarks to help guide the student to achieve the goal may also be listed. This lists where the student will receive special education services and which staff members will provide the services. If a student needs something other than the standard day or year (for instance, if a student needs summer school), it is noted here. This is used for students in high school to identify the steps necessary to prepare them for post-secondary work.